Although information on this site is believed to be correct, the information is provided on an "as is" basis and its accuracy and/or completeness cannot be guaranteed. No warranty of any kind is given with respect to the contents of this website. LONG ISLAND'S HOME COURT ADVANTAGE! ​"THE TIME IS ALWAYS RIGHT TO DO WHAT'S RIGHT"
Former First Team All-Long Island player Mitch Kupchak from Brentwood has been hired as the new President of Basketball Operations and General Manager of the NBA’s Charlotte Hornets. He will lead the organization’s day-to-day basketball operations for Hornets owner and fellow Tar Heel Michael Jordan. “In every role and in every stop during his tenure in the NBA, Mitch Kupchak has brought the highest levels of success to his teams. He’s a proven winner,” Jordan said. “Having won championships as both a player and an executive, we have confidence that Mitch is the right person to lead our basketball operations, build a winning culture and bring sustained success to our organization, for our fans and for the city of Charlotte.” Kupchak returns to the state where he was ACC Player of the year while attending the University of North Carolina and has jersey #21 retired there in his honor. His longtime NBA career includes 10 NBA Championships - three as a player and seven as an executive with the Los Angeles Lakers. Tuckahoe proved to be a worth opponent, battling the Tuckers all the way, but they just couldn't stop Ahkee Anderson and Jaxan Swann from scoring. The two combined for 55 points and Jude Swann added 17 points and 13 rebounds to lead Greenport to their second consecutive New York State Final four. Center Moriches was a heavy favorite coming in, but nobody told the Seahawks, who battled them all the way on the strength of an outstanding game by Aiden Adomaites, who demonstrated what many already believed - that he is one of Long Island’s best big men. His matchup with Red Devil big man Micah Snowden, who has been dominant in recent games, was a classic from the start, with CM going into Snowden repeatedly and Adomaites holding his ground and making it clear that this would be an old school style confrontation between two big, strong, and talented post players. The difference in the game was Sean Braithwaite, the 6’4 Center Moriches guard that always presents matchup problems, and his 20 point, 10 rebound, 8 assist performance carried the Red Devils to the Long Island Class B Championship. LongIslandBasketball.com and NewYorkStateBasketball.com are sponsoring a free service that finds new and challenging non-league opponents for high school varsity teams from all over the Northeast. NOW IS THE TIME TO PUT TOGETHER AN EXCITING NON-LEAGUE AND SHOWCASE - TOURNAMENT SCHEDULE FOR NEXT SEASON! Tell us what level of competition you’re looking for, how many games you’re looking for, any date restrictions or other restrictions, and we’ll send it out to almost 1000 coaches and event organizers from Maine to Florida to right next door. We put together well over 100 non-league games this past season and found teams and last minute replacements for tournaments and showcases from all over the region. Baldwin's Daraja Rodwell of Dominican College scored his 1000th point on February 5, 2019. The second upset win for the defending champions and another outstanding defensive exhibition. Brentwood brushed aside another team you would expect would provide them with a real test. Brentwood was not about to give the Cougars, who had battled them twice during the regular season, any hope this time, jumping out early and dominating them from whistle to whistle. Bryce Harris led the way with 25 points and 15 rebounds, Jordan Riley had 20 points and 10 rebounds, Romello Wright 18 points, and Kenny Lazo added nine points, seven rebounds and six assists. Aidan Keenan led Commack with 23 points. The teams split during the regular season, but the Bees took care of business in the title game. The Panthers had given up a big early lead, but a technical foul call, resulting in a pivotal 5 point swing, put Miller Place back in front and the hosts and #1 seeds went on to eliminate the defending champion Warriors. The Thunderbirds built an early lead, but host Riverhead chipped away at it, and an Albert Daniels layup gave them the lead with 26 seconds remaining and two Zy'Aire Pittman free throws providing the final margin. Hills West's Tobias Harris, Danny Green from St. Mary's, and OSNA's Cheick Diallo give Long Island three players in the NBA. That is more than 13 US states and more than China, Greece, Italy, Lithuania or Russia! In a terrific Suffolk League 5 showdown, Wyandanch held off a late Mt. Sinai run to capture their 9th straight victory and move within a half game of league leader Miller Place. Bellport’s Jaye Bookhart scored 43 points, going 7-11 from the three point line to lead Suffolk Community College to a come from behind victory over Borough of Manhattan Community College (17-3). The Sharks remain a perfect 15-0 and ranked #1 in the country. Soon after completing the best season in Hills East girl's history (21-3, League 3 Champs and Suffolk Finalists), coach Adam Cirnigliaro began looking at next year’s roster. Four talented seniors would be gone. The opportunity was immediately obvious for this young coach and his 2018-19 Thunderbirds. “ I knew we had a lot of work to do, and I’m lucky .... because these girls love to show up at practice everyday. We have a different team this year but one that is relishing the opportunity to prove themselves on the court against very good opponents.” The Northport starting five is tall and talented. They can pass it, shoot it, and defend. This appeared to be a twelve round bout from the tap , both squads digging in on defense, guarding their yards like loyal and loud canines. The game remained scoreless until 4:09 when Northport’s Danielle Pavinelli scored the game’s first points with a 3. East’s Sophia Tawil (11pts/8rbs/8ast.) followed with a 2 . Northport’s Hannah Stockman ( 11pts.) scored. Tawil hit a 3. The back & forth slugfest was ON and would continue throughout the game. When the Tiger’s Alexa Gentile drove the baseline for a bucket “and 1”, the first ended in an 8 ALL tie. Northport’s Rich Castellano and HHHE’s Adam Cirnigliaro would administrate this early January contest with an eye on championship implications. Few minutes were shared. Both “benches” were enthusiastic, engaged, and ready. By our count, 34 fouls were assessed as the officials tried to keep the peace. On the first possession of the second quarter, the Thunderbird’s McKayla Jones ( 12pts/7rbs.) demonstrated her ability to affect a game with her signature defensive intensity. Jones beat the Northport point guard to her spots and her backcourt teammate, Alyssa Studdert ( is she 5’1 ? ) hounded Stockman in the post. The home team took a 20-17 lead to the locker room at the half . Northport came out shooting, scoring on their first three possessions in the third on made field goals by Kelly McLaughlin, Shea Cronin, and Kerry Dennin. Tbird Tamara Graham broke through the Nport “D” for a right-handed layup giving her team a 26-23 advantage with 5:16 left in the third. Tawil penetrated the lane delivering two beautiful assists. East led 34-30 after three quarters. In the fourth, a Cronin 3 put her Tigers within 1,, 36-35 with less than 7 minutes to play. It's about time! We were lucky enough to be there when Baldwin won a Federation State Championship last season, and it inspired us to take our first steps towards launching complete Girls Basketball coverage, so we're starting off with a few selected games this year. If you can help point us in the right direction by suggesting future games between top teams, or even better, if you'd enjoy covering a game or twofor us, LET US KNOW! Proudly displaying their red & white school colors, the Island Trees girls remind us of that powerhouse NCAA team! No,, NOT UCONN Women’s .... but rather, The Alabama Crimson Tide. The Trees, led by Head coach Bobby Kaible and his assistant Anthony Rizzo are one of the best coached teams in Nassau, boys or girls. So far, in 7 wins they are out scoring opponents 72-55. In The South,, they yell out : “ ROLL TIDE”!! In Levittown,, the cry is : “YEA DAWGS”!! In fact, amongst their loud supporters are the guys from the IT boys team. Pretty cool ! Many of the boys games we’ve seen this year across the County are like high school dances from the ‘50s .... the first few minutes of games are a “warm up”,, with coy, slow moving moments, just figuring things out. Not necessary for the Lady Bulldogs. Their offense begins on the far end of the floor with an intense, ball-pressuring defense. They hard contest, box out, and sprint to spots in transition. Junior forward Brianna Fitzgerald (18 points) was impressive with powerful, straight line drives to consecutive righty finishes in the home team’s 25-9 opening quarter. When Mercy caught on, collapsing the lane , the IT kids ran their sets with urgency, kicking out deftly for easily made 3s!! Mercy seemed ready to withstand the home team’s initial knock out punch when they switched sophomore shooting guard RileyJones Rottkamp (9pts./6ast.) to the point. She shredded the IT extended press with Tom Brady-like one handed strikes to fellow sophs Kaitlin Anderson (15pts.) and Lauren Goldberg (10pts.) for easy scores. Unfortunately, what looked to be a competitive comeback was upended when Goldberg went to the bench moments later with her second foul. Now entering his 9th year, Coach Kaible and his crew seek a three-peat as Conference Champions (45-12 since 2015 ). They will be challenged by strong Conference A-5 opponents, Locust Valley (5-2) and Mineola (6-1 ). The Ospreys have cruised through a challenging December schedule unscathed, not only winning but winning convinvingly. They improved to 8-0 behind 21 points and 7 rebounds from Nick Suter and 19 points and 16 rebounds from Aidan Adomaites. Khalil Williams had 11 for the Baymen. Impressive win for the Falcons! Lynbrook was knocking on the door of the Sweet 16, and I'm sure South will be now! Their two losses have been in triple overtime at Uniondale and by 3 at home against unbeaten Cold Spring Harbor, another team knocking on the door! A decisive 27-14 third quarter was the difference in this one. Corey Powell had a breakout game, finishing with 31 points and 10 rebounds and Aaron Davis always puts up good numbers, finishing with 16 points and 14 assists. Elijah Johnson had a monster game on the boards, pulling down 15. James Montgomery led Lynbrook, who suffered their first loss, with 17 points. Statement win by the Tigers over the unbeaten Marauders! Looking back, that big comeback win over Riverhead got preseason ranked Northport back on track after an unimpressive start. Sean Walsh erupted for 37 points, 7 rebounds, and 6 assists to lead the way, knocking down 8 threes in the process, and Ian Melamerson added 8 points, 12 rebounds, and 4 blocks. Malachi Coleman led the balanced Bay Shore attack with 12. The Portlage team continues to improve, picking up a nice win over a solid Class B CHSAA team. No mystery who led the way! Zaire Baines finished with 30 points and Jamire Primer 18 points and 10 rebounds. Aazayah Ross was big, controlling the paint with 14 rebounds and an incredible 11 blocked shots. What has always been a fierce rivalry was made even more intense this season when Micah Snowden, who finished the game with a triple-double, racking up 18 points, 17 rebounds, and 10 assists, transferred from Southampton to Center Moriches this summer, seemingly shifting the balance of power to the Red Devils. Yet despite his outstanding performance, the rivalry prevailed and it was yet again another exciting game between two good teams. In the early going, CM, who has played a brutal schedule so far and was only 1-4 coming into it, had the upper hand and led the unbeaten and foul plagued Mariners by 10 at intermission, but Southampton closed the gap in the third quarter behind a boisterous crowd and the three point shooting of Kristian Wheeler, who had 5 on the day, and got within 5 before a Snowden putback and free throw stopped the run and the Red Devils held on from there for the big win. Tyiquon Nix had another big game for CM with 18 points, 4 assists and 5 steals and Sean Braithwaite added 13 points and 5 assists while Marcus Trent had 14 for Southampton and Dakota Smith 11. A late score prevented the Panthers from getting the recognition they deserved after knocking off defending State Champion Amityville last week, and they took it out the Bonackers, blistering them with a 24-6 first quarter and then a 23-6 third quarter to improve to 6-1 on the season. Thomas Cirrito led the balanced attack with 15 points and 5 steals, Justin Leichter had 12 points, Tim Hirdt 10, and Tom Nealis chipped in 8 points and 16 rebounds. Good news for Daler fans. Returning All-Long Island sophomore Marvel Chambers is rounding back into shape after an injury that ended his season last year. He scored 22 points and pulled down 10 rebounds and Luis Smikle Jr. added 20 points and 6 assists in a convincing win over GNS. David Sabvehroo, Long Island' s leading three point shooter last season, had a game high 24 points, including 7 threes for the Rebels. Atre the Marauders back? They improved to 4-0 with a strong performance at home. Isaiah Baker led the way with 19 points, 10 rebounds and 4 assists and Malachi Coleman added 16 points. Shawn Drake had 12 for Floyd. Its a rare year when Syosset doesn't start the season unranked and then force itself into the Sweet 16 the old fashioned way - by winning games. That's the way they are headed once again after Robert Kula led a second half rally to improve their record to 4-1. He finished with 21 points and 10 rebounds and Rob Berland added 16 points. North's balanced attack was led by Kyle Kamali with 11. The Owls passed another tough test, defeating another Class A contender, and Long Island All-Star Rylan Blondo had a big game, finishing with 37 points, 5 rebounds, 4 assists and 4 steals. Bayport-Blue Point is in a rebuilding mode, and Team Long Island selection Pierce Prendergast is leading the way. He carried them in this one with an incredible stat line: 44 points, 14 rebounds, 10 blocks and 7 assists, and he hit the game-winning free throws with 1.7 seconds left too! Malachi Miller led a solid East Hampton team with 29 points. It looks like Kellenberg is ready to compete in the NSCHSAA this season after decisively snapping Long Beach's 5 game winning streak. They've got a big-time player in Nick Spinoso, who had 23 points, 14 rebounds, and 4 assists in this one, a reliable scorer in Sean Lackman, who is averaging 18 ppg, and Sean Boll is running the point with skill, registering 10 points and 8 assists against the previously undefeated Mariners. 14 year old Portledge HS freshman Zaire Baines, who scored 677 points as an 8th grader on varsity, recorded the 1000th point of his career in a 79-58 Portledge win over Staten Island Academy! The Colts opened some eyes with a convincing win over the Bayhawks, who came into the game 3-0. It was tight for thee quarters, but Calhoun put together a 19-6 fourth quarter to put it away. Team Long Island selection Corey Jones led the way with 19 points and Thomas Casimano added 10 while Darien Matthews led Doms with 10. The Porters bounced back nicely after a tough defeat at the hands of #5 St. Anthony's, holding off traditional Class AA power Central Islip on the road behind 33 points, 8 rebounds and 5 assists from Ahkee Anderson and 20 points, 14 rebounds and 5 assists from Jude Swann. Team Long Island selection Ty-Shon Pannell let CI with 27 points. The Mariners improved to 5-0 with a win over always tough Syosset. Jayden Barwicki led the way with 13 points and 5 rebounds and Lashawn Hankins was right behind with 12 points and 3 steals. Rob Berland had a game high 21 points, including 6 three-pointers, for Syosset. The Firebirds picked up a nice win over the defending Section 8 Class A Champions. Sean Lachman led the way with 5 three-pointers and 27 points, while Nick Spinoso controlled the paint, finishing with 19 points, 14 rebounds, and 5 blocks. James Cashwell was high man for the Trojans with 19 points. New York State Class AA Finalist Hills East graduated four starters, but it looks like key contributor Max Caspi, who scored 20 points and pulled down 14 rebounds, and lone returning starter Shane Dean, who finished with 17 points and 8 assists, might have the T-Birds back in the mix this year. Team Long Island selection Pierce Prendergast led Bayport-Blue Point with 18 points. 12/6. Wow! Long Island Class B is stacked this season, and another contender just entered the ring! Returning All-Long Island Freshman Michael Warren led the way with 19 points and Jayden Seraphin added 11 points and 10 rebounds. Both were on Malverne's undefeated JV team of 2016-17. The Colts have moved down to Class A this season and announced their arrival with a flourish, impoving to 2-0 with a win against Class AA East Meadow. Jaylen Seay finished with 21 points, Bryce Bland had 14 points and 10 assists, and Brent Bland 20 points and 6 rebounds. Two private schools that are upgrading their basketball programs and are the preseason favorites in the PSAA met in what turned out to be a classic back and forth match-up, with Knox coming away with a dramatic win on their home court. Marrel Laze led the balanced Knox attack with 18 points while Zaire Baines led all scorers with 37 for Portledge. It's early, but the Killer Bees look primed for another run at a state championship, rolling over this year's version of the consistently good Babylon program. Returning All-New York State selection JP Harding led the way with 25 points and 11 rebounds, Nae'jon Ward added 15 points and 11 assists, and William Walker chipped in 13 points and 10 rebounds. Peter Szouchy led Babylon with 19 points. Long Island All-Star Jayson Delgado, who was the third gun on last season's Section 8 finalists, has stepped into a leadership role this season at Floral Park and responded by scoring 19 of his 30 points in the decisive third quarter, adding 7 assists. Michael Matich had a big game too, scoring 22 points and pulling down 13 rebounds. 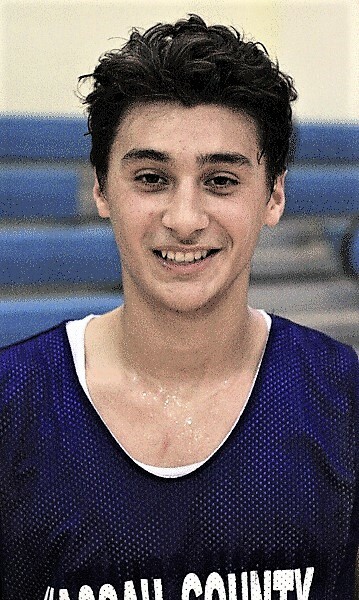 Jacob Levy led Roslyn with 21 points. 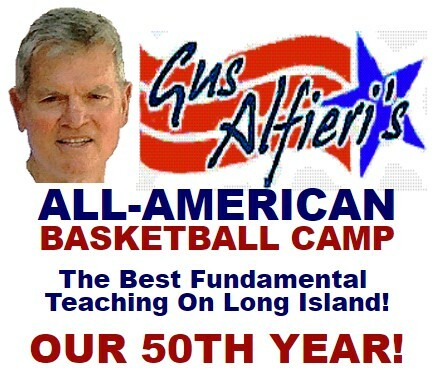 Long Island basketball royalty descended on Our Lady of Mercy Academy in Syosset to help celebrate the amazing 50th anniversary of Gus Alfieri's highly acclaimed All American Basketball Camp. Coach Alfieri (left), began his career as a star player at St. John's University before going on to coach at St. Anthony's, where he led the program to state championships and national prominence. He is joined by two of his most accomplished proteges - current NBA Head Coach Ken Atkinson of the Brooklyn Nets (center), who played for Coach Alfieri in high school and was a camp regular before going on to a terrific career at Richmond and in overseas pro leagues, and Rich Wrase, most recently a scout for the NBA's Los Angles Lakers and also a former camper who starred at Half Hollow Hills High School before going on to coach Westhampton to a high school state championship and Suffolk Community College to two junior college national championships. Coach Atkinson, who credits Coach Alfieri with inspiring him to be a coach, delivered an outstanding presentation on finishing techniques to an eagar and appreciative group of campers, but the highlight of the day had to be the lunchtime gathering of former players and coaches, who along with Coach Alfieri, traded one fascinating war story after another about camp legends like Dr. J, Bobby Knight, Lou Carnesecca, Rollie Massimino, Jimmy Valvano, Mike Krzyzewski, Hubie Brown and others, and also about those memorable championship seasons at St. Anthony's and their historic games against LuHi, New York City and upstate powerhouses, and their Catholic League rivals. A truly unforgettable day! Northport's Kenny Atkinson, the Head Coach of the NBA's Brooklyn Nets, gave an outstanding lecture at the well attended high school coaches clinic held at the Nassau Coliseum on Saturday 8/11. He covered multiple topics, accompanied by thorough game film demonstrations, and gave us all a glimpse of what it's like to break down game film in the NBA. Really enjoyed it! Pictured above, Coach Atkinson joins fellow members of the Northport basketball community, where he grew up. From right to left, his brother Steve, the Head Coach at Half Hollow Hills West, Ted Thomas, Editor of Long Island Basketball.com, Nets Coach Kenny Atkinson, one of 8 Atkinson brothers, Tom Fitzpatrick, the just retired head coach at Walt Whitman, Andrew D'Eloia, the Head Coach at Northport, and Ryan Fitzpatrick, Coach Fitzpatrick's son and an up and coming player in the Northport School District. Legendary Long Island Coach Rich Wrase, who guided Westhampton HS to a New York Federation State Championship and Suffolk Community College to a pair of Junior College National Championships, has joined the staff of the NBA's Charlotte Hornets as a scout. Last season, after leaving the Los Angeles Lakers, Coach Wrase guided Team Long Island to a semifinal run at the famous NIKE/IS8 Tournament, helping set the stage for what we believe is the beginning of the next Golden Age of Long Island basketball. We are all indebted to him for that and wish him the very best of luck with the Hornets. Hills West's Tobias Harris, on an expiring contract, has been traded to the Philadelphia 76ers, the 5th team he wil play for in his 8 year NBA career! Philly has been mostly good to Long Islanders. Dr. J got his NBA title there, Long Beach grad Larry Brown had great success there during the Alan Iverson era, and Plainview's Marc Ivaroni was a role player on their 1983 Championship Team, but Sachem's Jeff Ruland had his two time NBA All-Star career come to an end there after only 5 games due to cronic injuries. LWA's Jeff Weiss picked up his 600th career victory! posted his 250th career victory. Bellport senior Jarell White collected his 1500th career point and 1000th career rebound this season, becoming the school’s all-time leader in both categories. Senior Sean Braithwaite became the Center Moriches all-time leading scorer, passing the record held by Jon Ward-Adams '10 of 1,498 points. 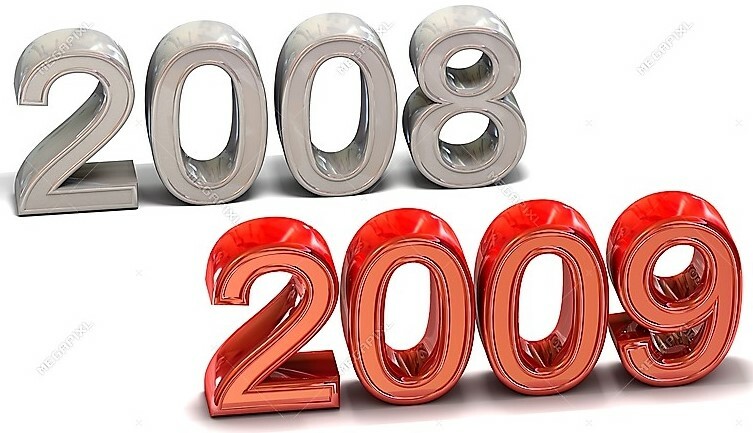 LWA senior Aidan Igiehon, who is headed to Louisville, scored his 2,000th career point this season and teammate Tyler St. Furcy, who is headed to Marist, scored his 1,000th career point. surpassed both 1000 points and 1000 rebounds this season. Deer Park junior Malik Edmead scored his 1,000th varsity point. He is leading the Falcons in points, rebounds, assists and steals this season. scored his 1000th career point this season, leading the Porters to an 18-1 record so far. Hills West's Tobias Harris will be a free agent after this season and is posting career best numbers so far, averaging 21.2 points, 7.9 rebounds, and 2.6 assists while hitting 43.3 percent of his three-pointers. One thing we know - Tobias is a relentless worker and will only get better! It's been a great season for Long Island college basketball so far, with several of our teams attracting national attention while poor LIU Post limps along after losing most of their team when it was announced that this is the last year of their D2 program. After a string of losses by other top teams, nationally ranked LuHi, #15 in the USA Today Poll, remains firmly entrenched at #1 in New York State, and Brentwood, who is still undefeated, moves into the #2 spot in the New York State Sportswriters Association Class AA Poll. The last time two Long Island teams occupied the top two spots in the Large School Poll was 1983-4, when St. Agnes and North Babylon tied for the top spot. It is an incredible resource and they have plans to make it even more incredible, so bookmark it and enjoy! It was a late score on Wednesday, and frankly, we missed it, but it bears pointing out that Marco Travaglione had 48 points in the loss, shooting 72% from the floor! Once again, Long Island boys varsity teams are off to a commanding lead in the season series between the two regions, up by a whopping 15 games through December 31st. Suffolk County bounced back decisively from their surprisingly one sided Alzheimer's game defeat, sweeping both the Future Stars and Elite Seniors games of the Long Island Preseason Public School All-Star Doubleheader. Bellport star Jarell White led the way in the Seniors Game, erupting for 41 points to hold off a Nassau rally, and he got help from Kings Park's Brendan Kehoe, who added 21 while Commack's Spencer Malloy and Mattituck's Xavier Allen combined for 33 points to lead a second half Suffolk run that blew open a close Future Stars Game. Lynbrook's Rylan Blondo was very impressive for Nassau in the Seniors Game, finishing with 27 points from the point guard spot, and Floral Park's Jayson Delgado was right behind him with 26. This one’s on me. From day one, I’ve been telling the kids to go all out every minute of every game because our roster is so deep and talented and I can sub them out when they get tired without missing a beat, and we’ve been playing that way every game with great success, but after a good first half, we gave up a 15 point lead early in the second half and I decided to go with just 7 kids the rest of the way. Of course, the kids continued to play their hearts out and retook the lead, but at that pace, they eventually started to run out of gas. Even so, we still had a chance to pull it out, but I didn’t call time out quickly enough when we rebounded a missed free throw trailing by 2 with time running down. There would have been plenty of time to set up a play and go for either the tie or the win, but we ended up turning the ball over and fouling instead and it was over. 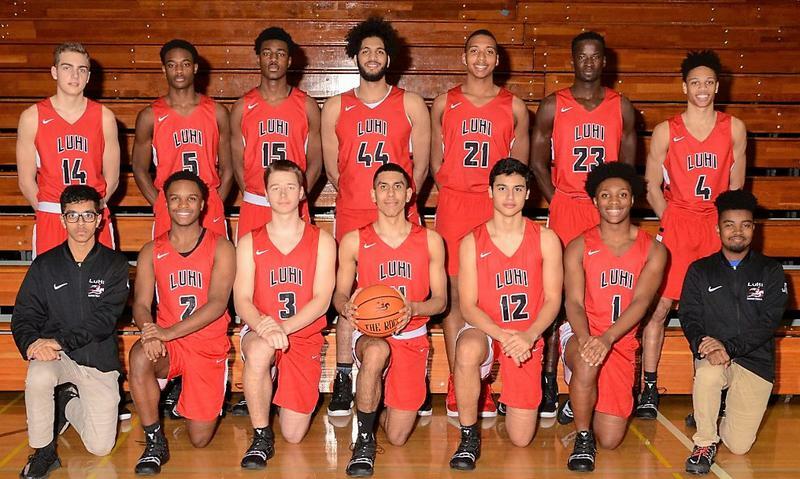 It's a shame, because this team was special, and with a win, we would have gotten two missing starters - LuHi’s Zed Key and Chaminade’s Michael O’Connell - back for next weekends semifinals and had a real shot at going all the way. Tough lesson. Bryce Harris, who blossomed last season at Brentwood, was big time again in this one with 19 points, but I want to make special mention of my two team leaders - Baldwin’s Rhyjon Blackwell and Deer Park’s Malik Edmead - who both had 18 points and took on one highly rated guard after another in the 6 games we played, including this one, and outplayed them all. In a tournament filled with high major commits, there was no better backcourt. Longwood’s Jarnel Rancy was also a revelation. 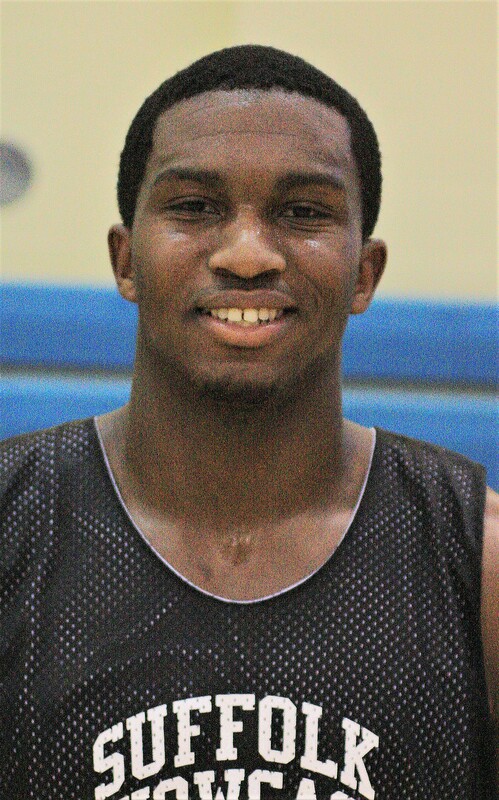 A gifted shot blocker, rebounder and defender, he was never outmatched, and the same can be said for Westbury’s Tyreik Frazier, who shares those gifts. Like I said, this one was on me. I will post a season wrap-up in days ahead. Second seeded Team Long Island rolled to a spot in the quarterfinals yesterday behind 23 points from Deer Park's Malik Edmead and 17 from Baldwin's Rhyjon Blackwell and will play again today (Sunday) 12:45 at the Boys & Girls Club of Metro Queens. Once again it was their defense that keyed Long Island's dominance, with Longwood's Jarnel Rancy controlling the boards and protecting the paint and Brentwood's Bryce Harris and Chaminade's Mike O'Connell contributing strong all-around games to lead a deep and talented roster that saw good contributions from everyone that played. The Nike/IS8 playoffs begin tomorrow (Saturday), and after going 4-0 in pool play, Team Long Island has a first round matchup at 12:30 at the IS8 main gym. If they advance, they play again Sunday 12:45 at the Boys & Girls Club of Metro Queens. Team Long Island held on for a another big win, finishing 4-0 in pool play heading into next week's playoff round despite playing with a depleted frontcourt. Brentwood's Bryce Harris, who missed the first three games, stepped up big time, leading the way with 17 points, Baldwin's Rhyjon Blackwell had 14, Amityville's Divaahd Lucas was also a force, adding 13 and Deer Park's Malik Edmead had 10 points and both he and Blackwell did an excellent job on the defensive end against a highly rated backcourt. We will post playoff seedings and matchups as soon as they are released. Team Long Island has a tough task ahead - they are facing a showdown Saturday 9/29 at 10 am at the IS8 main gym for first place in their pool and for a high seed in next weekend's playoffs, and they will be without three of their starters. A win would make them 11-1 in IS8 pool play over the past year. Shorthanded, everybody stepped up for Team Long Island and they rolled to their third straight impressive victory at NIKE/IS8, with Deer Park's Malik Edmead leading the balanced attack with 17 points. Corey Jones from Calhoun and Divaahd Lucas from Amityville both had 8 point games, and John Glenn's Josh Fenner had 7 to pace an attack that saw all 11 players on hand put points on the board. To top it off, their team defense was once again outstanding, and with Jarnel Rancy from Longwood and Tyreik Frazier from Westbury dominating the paint and rejecting more shots than I could count - Long Island won going away. Pool play wraps up next Saturday 9/29 with a 10 am first place showdown at the IS8 main gym, and the playoffs begin the weekend of 10/6, with times, locations, and match-ups to be announced. We have been blessed with a problem most coaches only dream of - having more great players on our roster than we can possible bring to a game. You will undoubtedly see some of those players in future recaps. 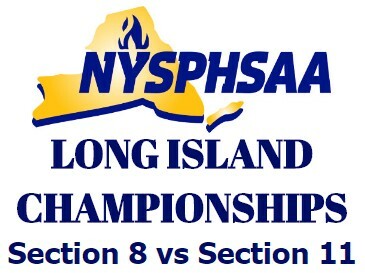 EDITORS NOTE: I want to thank the Long Island basketball community for their enthusiastic support of Team Long Island. Our long term goal is to unite the community and help bring about the next Golden Age of Long Island basketball, and its beginning to feel like that's right around the corner! Thanks everyone for your encouragement. The kids feel the love! One of the big high school events of the summer season, the annual Hofstra Team Camp, featured 16 high school teams from both Long Island and New York City this year, with each team playing a total of 6 games over three days. The results bode well for the NSCHSAA, whose teams took the top three spots at the camp. Camp Champion Chaminade emerged as an early league favorite and was never seriously challenged at the camp, while Holy Trinity, the other finalist, played excellent small ball and defended well throughout. St. Anthony’s, with a young and and talented squad, defeated a good Baldwin team for third place. Both teams need time to jell and will be much better once the season gets underway. Another good small ball squad, Northport, impressed, outlasting rival Commack for 5th place. Both will challenge in Sec 11 AA. 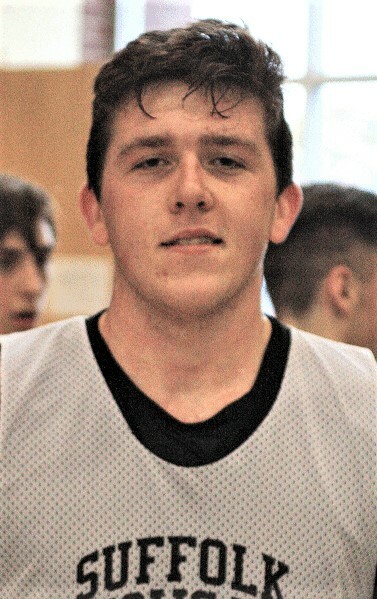 In a heartbreaker, Suffolk County fell 63-61 to eventual champion Buffalo in the Semifinals of the New York State Basketball Coaches Association Summer festival, falling on a putback with 2.5 seconds remaining. The Long Island squad led by 7 at the half. Suffolk finished pool play 3-1, tied for first place with Rochester, who they beat 83-82 in overtime to earn the top seed, while Buffalo was the 2 seed in the other pool behind Mid-Hudson. Suffolk had impressive performances from Brentwood’s Zed Key, who will play at LuHi next season, Deer Park’s Malik Edmead, and Brentwood’s Bryce Harris while picking up wins over an Adirondack team led by Joe Girard III, New York State’s all-time leading scorer, who was held to just 13 points, the defending champion - Central New York - and Rochester. Nassau County did not fare as well, going 1-3. A new proposal still in its formative stages could deal a serious blow to AAU and Sneaker Company Basketball as we know it, and might very well be the beginning of the end for both competing camps. USA Basketball, the NBA, and the NCAA are all taking steps to seize control of the sport at the youth level, and one of the key provisions of the proposal, reportedly being prepared by the NBCA for submission to the NCAA Commission that was set up to look into the big recruiting and corruption scandal that hit NCAA and Travel Team basketball this past fall, is to discontinue the July Live Period, forbidding D1 coaches from attending the big events that are held annually in Orlando, Las Vegas and other locations across the country. It often costs teams thousand of dollars to attend these July events, and if there is no prospect of playing in front of D1 coaches, many teams will undoubtedly elect to take advantage of far less expensive alternatives, putting many of these events out of business. It's not a complete prohibition, though. If the proposal is adopted, it looks like the April Live Period will be retained for now. Two Long Island Coaches Face Off! North Babylon's Tyree Grimsley had 21 points and 8 rebounds to lead Suffolk CC to a win over Hostos in their opener..... Another North Babylon product, Billy Muller, had 15 points and 9 rebounds in Molloy's loss to Assumption..... 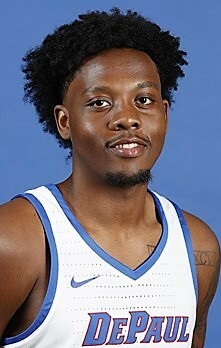 Yet another North Babylon native, Devonte Green, had 15 points and 3 assists in Indiana's win over Chicago State..... Freshman Darius Young from Westbury had 17 points to lead Nassau CC over CCBC Dundalk. Hills East's Savion Lewis, New York State Mr. Basketball, will redshirt his freshman year at Quinnipiac after it was discovered that an incomplete his sophomore year at Hills would prevent him from being eligible to play until January at the earliest. Rather than appeal and miss a significant number of games, he has decided to redshirt and have four full years of eligibility left. The NCAA requires student-athletes to take certain core classes every year of their high school careers, and the incomplete prevented him from meeting those requirements on time. April 29-May 2 to allow coaches to contact or evaluate recruits immediately following the April 26-28 nonscholastic events evaluation period. * Evaluation period June 13-14 at NBPA Top 100 Camp, a new collaboration between the NCAA and NBPA. * New evaluation periods June 21-23 and 28-30 at scholastic events approved by the National Federation of State High School Associations or a two-year college athletics governing body (i.e., NJCAA, CCCAA, NWAC). * Evaluation period July 11-14 at NCAA-certified nonscholastic events, a reduction in evaluation periods at these events from three weekends in July to one weekend in July. * Evaluation period July 23-28 at new youth development camps conducted by the NCAA and member schools/conferences. New York Holiday Invitational Concludes! RJ Meyers-Turner and the Knights came storming back from 17 down, but their desperation shot to tie it at the buzzer was just off target. After two heartbreaking losses to the Spartans during the regular season, Manhasset turned the tables on them in the playoffs, defeating the #1 seed and advancing to the Section 8 Class A Championship Game. 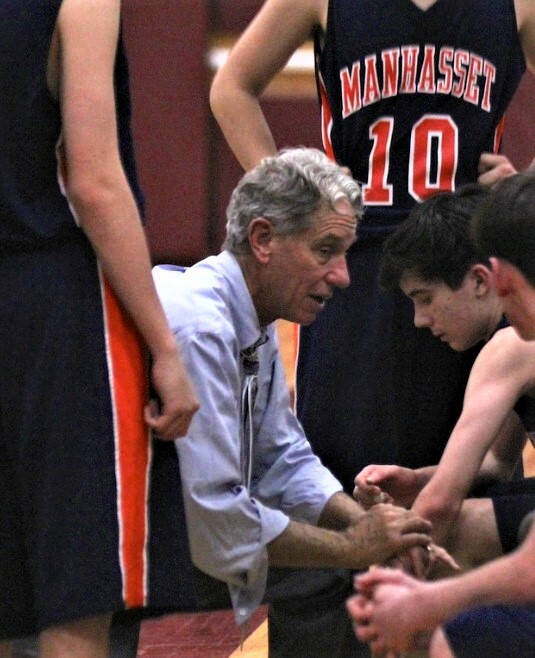 The pregame message from Manhasset Head Coach George Bruns was simple: Win Each Quarter! That's exactly what they did. The Indian were up by 2 at the first quarter buzzer and up 5 at intermission, but Elmont challenged for the lead late in the third quarter, with Qai Kellman’s three-pointer cutting the margin to a single point. Manhasset responded, with Tom Santella rebounding and scoring and Chris Themelis draining a three-pointer in the final seconds to take the quarter 9-8 and put Manhasset up by 6. Their run continued into the fourth, with Ahmad Crowell rebounding and scoring and Themelis knocking down another 3 to make it 43-32 Indians, but one last Elmont run cut it to 5. They never got any closer. Santella was Manhasset’s high scorer with 11 points and he added 10 rebounds and Cromwell finished with 9 points and 8 rebounds. Kellman and Jevon Santos both had 12 for the Spartans. The Titans rolled past the Friars, pulling away with a 13-2 fourth quarter to claim a spot in the NSCHSAA Championship Game. Tim Kiggins, a steady contributor all season long, came up big in the playoffs, knocking down 5 threes and finishing with a game high 21 points. Mike Sixsmith was his steady self, adding 18, and so was A.J. Knight, who rounded out Holy Trinity’s balanced attack with 15 points. Angelo Andino had a season high 15 points for St. Anthony’s, who struggled to score against the excellent Titan defense. 2/24. You knew going into this game that it would be an intense, low scoring matchup. These neighboring schools, just over a mile apart, split two games like that during the regular season, and this quarterfinal rubber match was no different. Sewanhaka took a 2 point halftime lead, Elmont went up by 1 after three quarters, and they battled right to the finish. I'm not sure I've ever seen anthing like what's happening in Nassau A1, with 5 teams still in contention for a playoff spot with one game to go! If the road teams win, they take the two spots, and if the home teams win, all 5 teams will be tied at 5-7! and Clark, who is on the road at Friends and the winner of that game will qualify. More reader questions answered. Do you have one of your own? Then ASK THE REF! Not a game goes by without fans, coaches and even TV announcers getting frustrated when an "OVER THE BACK" call isn't made as players are going up for a rebound. FYI - THAT'S BECAUSE THERE IS NO SUCH CALL IN THE RULEBOOK! Amazing how many people think there is! Pushing is a foul, holding is a foul, but there is no rule preventing a player from going up and over another player from behind! Curious about a call or a rule? They say that defense wins championships. Which teams are best at stopping their opponents from scoring so far this season? The Friars gave up a big lead, but Tristan Correa saved the day, rebounding and scoring at the buzzer. Since the year 2000, either Baldwin or Uniondale has appeared in every Section 8 large school Championship Game, and they have faced each other in 7 of them, with Baldwin leading the series 4 to 3. It was a classic Sweet 16 confrontation between two next door neighbors! The undefeated Bulldogs had been dominant at home, but not so much on the road, while the Falcons had struggled all season against Sweet 16 competition, going 0-3, and that included a home loss to #5 Uniondale. But the X factor at Deer Park is always the home crowd, who never fail to create a big game atmosphere, and they did it again, inspiring the Falcons to an imposing 13 point lead at the first quarter buzzer. North Bab managed to cut into it, trailing by 8 at the half, but despite the single digit lead, it still felt like the Falcons were in control. That changed in the third quarter. It started with back and forth action, but as the quarter wound down, the Bulldogs seized the momentum, closing it out on a 12-2 run to take a 40-39 lead with three quarters complete. This time, it was the Falcons turn to inspire the crowd, and they stopped the North Bab run as the final quarter began and retook the lead, but in the game's final minutes, one player took control. Trailing 49-44, NB's Frank Toney methodically scored the game's final 6 points, leading the Bulldogs to a thrilling come from behind victory and a 12-0 record, and of course, handing Deer Park and that great home crowd a devastating loss. Ouch! The Flyers were fresh off of beating Iona Prep, who was fresh off of beating Stepinac! It looks like the defending PSAL AA Champions are looking to repeat, and I'd have to say they have a very good shot. They blew out Christ The King too, but lost a 1 point game to Thomas Jefferson on the road the other day so they're not a lock. Chaminade was all banged up from beating Iona Prep the day before, and elected to sit two players to make sure they would be available for their big league showdown with St. Anthony's this Thurrsday. 1/6. The NSCHSAA has had great success over the years, but they might not have had a prouder day than Saturday, when three of their Class A teams swept three legendary New York City CHSAA Class AA programs at LuHi’s annual showcase. The biggest win of the three was Chaminade’s 48-40 win over Iona Prep - the 14th ranked Class AA team in all of New York State, but St. Anthony’s 63-50 win over Archbishop Molloy and Holy Trinity’s 60-51 win over Holy Cross were just as memorable for the players, coaches, and fans of both teams. I’ve said it before and I’ll say it again: The next Golden Age of Long Island basketball is right around the corner! Team Long Island selection Mike O'Connell led the way with 23 points, 6 rebounds, and 6 assists, earning MVP honors. Bellport rallied from 17 down to draw within 2, but the Bulldogs dug in and pulled away for a big League 3 victory in front of a raucus home crowd. There is no current ranking system for high school girls varsity teams on Long Island that we know of, but Longwood and Northport are certainly two of the top teams in Suffolk this season, and what a battle this was !! Coaching legend Rich Castellano’s Northport team immediately proved to be well-schooled in the art of press breaking and half court ball movement. Senior Hannah Stockman drained a “3” to give the Lady Tigers an early lead 14-12 at the 5:45 mark as the action began to heat up. Within seconds Nyia Longford answered for Longwood with a layup. It is possible that the talented Longwood senior may have the most devastating drop step on LI .... boys included! Sophomore Myles Goddard, who is averaging 14 points and 8 rebounds so far, has missed Amityville's last two games, but even at full strength, the Warriors are in for a fight in Suffolk A this season. Jesse Mas led the up and down Golden Flashes in this one with 26 points and 4 assists and Max Llewellyn added 13 points and 10 rebounds. Davaahd Lucas had 15 for the Warriors. Some great games and impressive performances by all of the Long Island teams, even Amityville in a loss! The former Brentwood standout has helped lead DePaul to contender status in the Big East! We are putting together our list of Long Island's best freshmen and are looking for nominations. Do you know a freshman or 8th grader that played a big role on his varsity team? Two of the best teams in New York State faced off and the Crusaders prevailed, with the final score closer than the game actually was. Albany made a late run but the end result was never seriously in doubt. Mattituck surprised everyone by beating Southampton, and now they have an even taller task with the 14th ranked and top seeded Red Devils. The Clippers swept the Falcons this season and have been very impressive down the stretch, winning 11 straight by an average of 25 points, but the Falcon’s are no pushovers, with wins over #13 Center Moriches and #10 North Babylon. The defending champions will have their hands full with the Bulldogs, but don't discount having been there before. Brentwood had two single digit wins in the season series. Could be interesting. Connetquot is a solid playoff team and gave the Lions everything they could handle earlier in the season, but Longwood is much better now and has won 12 in a row. A classic North Fork/South Fork matchup, but the Porters are the heavy favorites this season. The Rams avenged an OT loss in last year's final to capture their 2nd Conference Championship in the last three years and qualify for the D3 NCAA Tournament. Elmont's Matthew Graham led the way with 25 points, 7 rebounds, and 5 assists and Bayport-Blue Point's George Riefenstahl added 17 points and 10 rebounds. Won 3rd straight - in battle for 1st. Won 8 of their last 9. Ended season with 8 straight losses. The Killer Bees improved steadily over the course of the season and peaked during the playoffs, but they ran into an excellent Marathon team from Section 4 and lost a hard fought game far from home. Neither team had more than a 6 point lead at any point of the game. In the final minutes, Bridgehampton's Elijah White knocked down a three pointer from the wing and PJ Harding two free throws to bring the Bees back within 1 with 3:26 to play, but Marathon responded with 6 straight points to go up 63-57 with 54 seconds left and held on from there. Harding finished with 28 points and 15 rebounds, and White and Nae'jon Ward both had 13 points. What a memorable Championship Tournament! Great game after great game, including three overtime games on Saturday alone , huge crowds, college coaches galore - Syracuse's Jim Boeheim was there to watch New York State's All-time Leading Scorer lead his team to the Class B Title - and four Long Island teams advanced to the Final Fours in their respective classifications. I saw 13 games in two days, and I hope to have write-ups for you this evening. Although we only had one Long Island team advance to a championship game, we have a lot to be proud of and to look forward to! The following freshmen and 8th Graders made significant contributions to their varsity teams this season. Most people agree that Jeff Boals has a bright future as a basketball coach, but he never seemed comfortable on Long Island and never became an active member of the basketball community as his predecessors had. When his best season at the helm of the Seawolves ended in disappointment after his 24-8 team was shocked by 10-23 Binghamton in the first round of the America East Playoffs, he announced that he was leaving to return home to Ohio and coach his alma mater Ohio University of the MAC Conference. He was in the third year of a five year contract. 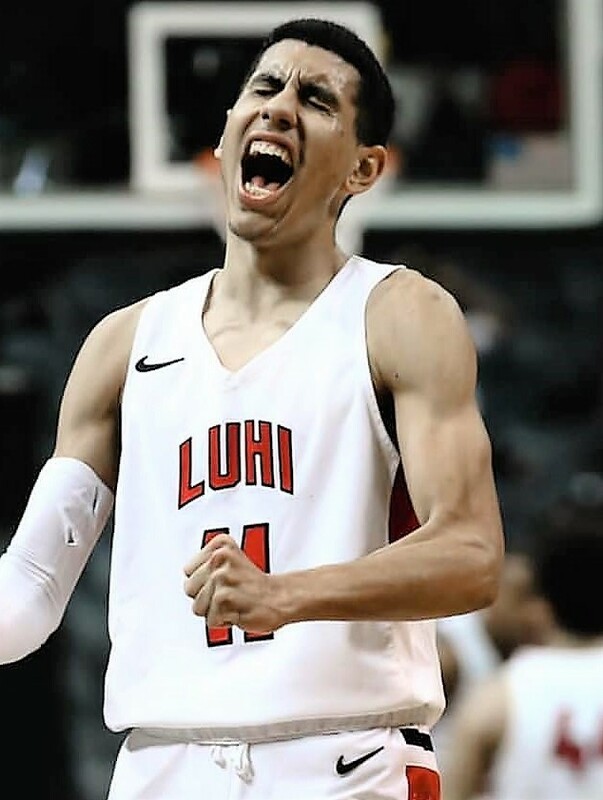 LuHi rode a dominating defensive performance to their record 8th Federation Championship, their first Class AA Championship, and their first win EVER against New York City powerhouse Christ The King. Andre Curbelo was outstanding, scoring a game high 23 points, Essam Mostafa was impressive against the towering CTK front line on both sides of the ball and finished with 11, and Jalen Celestine added 10 and helped lead the run that broke the game open in the second half. The Buffalo Catholic School concentrated on shutting down Louisville bound Aidan Igiehon, holding him to 5 points, but Marist bound Tyler St. Fury rose to the occasion, leading Lawrence Woodmere to a 5 point lead through three quarters before the Hawks rallied to capture the Class B title. St. Furcy finished with a game high 18 points. After terrific regular seasons, both Hofstra and Stony Brook fell short of the tournament, but there still Long Islanders there to represent us! Former St. Mary's, Suffolk Community College, and CW Post Coach Tim Cluess and his Iona Gaels, and fellow Long Islanders and head coaches Bill Coen from Northeastern and James Jones from Yale have all earned spots in this year's tournament, as did former Hofstra coach Jay Wright and his defending National Champion Villanova Wildcats.